In the beginning of our baptismal service, we acknowledge first that Baptism is God’s act, God’s initiative and God’s gift. It connects us to Jesus, the Church and eternal life. (–ELCA Service of Holy Baptism, Lutheran Book of Worship, p. 121). Martin Luther taught that every morning we are to rise and say, “I am baptized into Christ” and then go about our daily life inspired, guided, and empowered by our baptism as we live a life made new by Christ. The Holy Spirit guides and inspires us to continue in the covenant of holy baptism. 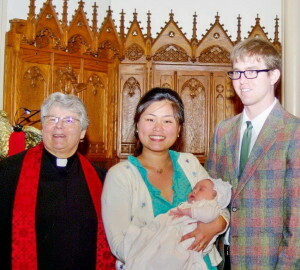 Holy Baptism is one of the two sacraments in the Lutheran Church, along with Holy Communion. The Pastor will look forward to meeting with anyone interested in learning more about baptism or seeking to be baptized in the near future including parents wishing to have their infants baptized. If you have any questions or desire a baptism at First Evangelical Lutheran Church, you may contact the Church Office or the Pastor, directly.